Larger, cooler, better! VAPEXPO Kiev 2017: unprecedented event! 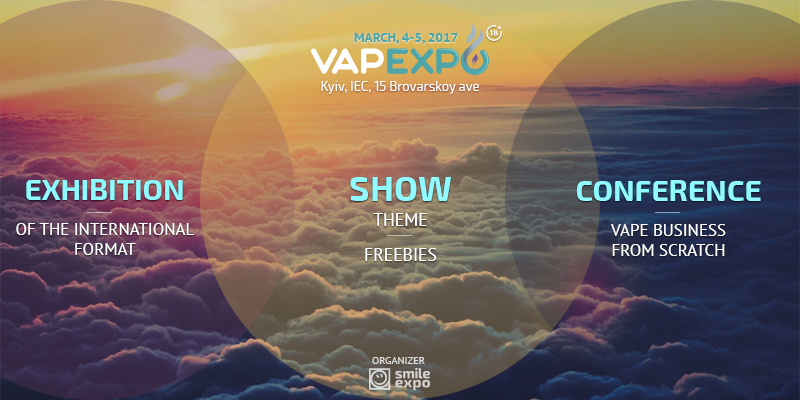 On March 4-5, Ukraine will vape again in Kiev International Exhibition Centre. But this time larger, thicker and more active, because it is a new VAPEXPO Kiev 2017! • America: the United States, of course! What should the Ukrainian vaping market expect in 2017, how businessmen managed to promote their vaping brand? How to implement eliquids production avoiding obstacles? All this and much more – at the VAPEXPO Kiev 2017 conference! Vaping business from scratch will be the key subject. At the event, you can do everything except one thing – to leave empty-handed. “Freebies” is the key theme of the show. Tons of giveaways, exciting quests and cool competitions by exhibitors! The show will contain hot girls performances, vape rings by the best trickers and stunning groove by a DJ. And of course cloud contests with top-quality prizes for winners! Everything will change at VAPEXPO Kiev 2017 except for the impeccable organization quality. Sing up!